2012-2016 Institute of Fundamental Biology and Biotechnology, Siberian Federal University, Department of Biophysics, Bachelor of Science in Biology. 2016-2018 Institute of Fundamental Biology and Biotechnology, Siberian Federal University, Department of Forest Protection and Monitoring. Master of Science in Biology. 53rd International Scientific Student Conference ISSC-2015, Novosibirsk. 7th International Young Scientists School “Systems Biology and Bioinformatics”, SBB-2015, Novosibirsk. III Bioinformatics Summer School, Moscow, 2015. 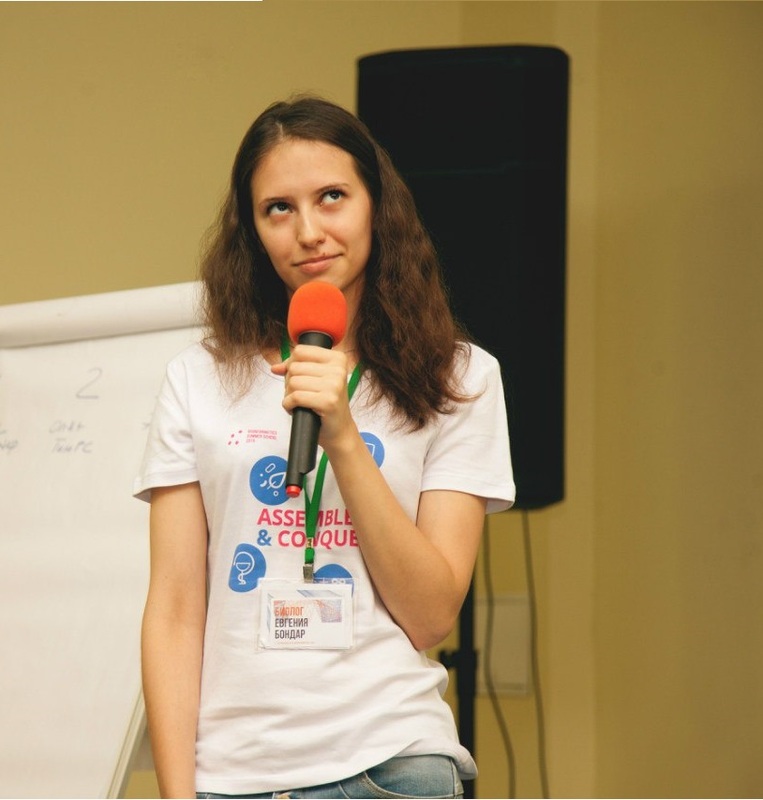 Youth Scientific Forum "Hybrid technology and biomedical applications", Kaliningrad, 2015. Forum of Young Scientists "Science of the future", Sevastopol, 2015.
International conference “Bioinformatics of Genome Regulation and Structure\ Systems Biology — BGRS\SB-2016”, Novosibirsk. 55th International Scientific Student Conference ISSC-2017, Novosibirsk. Seminar on System biology, Saint Petersburg, 2017. Krutovsky K.V., Oreshkova N.V., Putintseva Yu.A., Kuzmin D.A., Pavlov I.N., Sharov V.V., Biryukov V.V., Makolov S.V., Deych K.O., Bondar E.I., Ushakova O.A., Ibe A.A., Shilkina E.A., Sadovsky M.G., Vaganov E.A. Pinus sibirica and Larix sibirica whole genome de novo sequencing // The ProCoGen Final Open International Conference and Workshops on Promoting Conifer Genomic Resources. – 2015. – O-07. E.I. Bondar Assembly and annotation of Siberian larch chloroplast genome and the search for single nucleotide polymorphisms // Abstracts of the 7th International Young Scientists School “Systems Biology and Bioinformatics”. – 2015. – С. 13. Bondar E.I., Putintseva, Y.A., Krutovsky K.V.. Siberian larch chloroplast genome analysis over triplet frequency distribution // Abstracts of the tenth international conference on bioinformatics of genome regulation and structure\systems biology. — 2016. — C. 48. Bondar E.I., Sadovsky M.G., Putintseva Y.A., Senashova M. Yu. Comparative studying of multicluster structure of chloroplast genomes // Abstracts of the eighth International Young Scientists School “Systems Biology and Bioinformatics”. — 2016. — C. 12. Sadovsky M. G.; Bondar E. I.; Putintseva Yu. A.; Oreshkova N. V.; Vaganov E. A.; Krutovsky K. V. Seven-Cluster Structure of Larch Chloroplast Genome // Journal of Siberian Federal University. 2015. Vol. 8(3). P. 268-277.